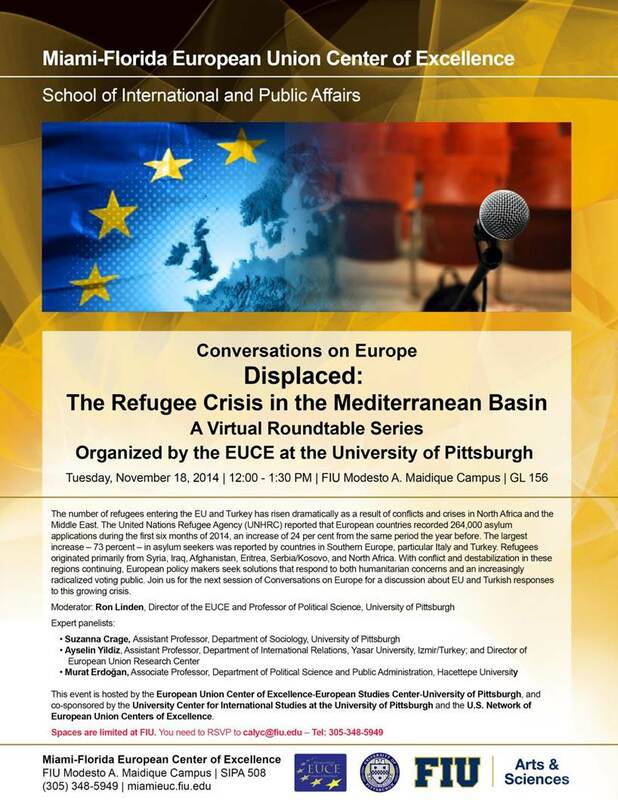 CONVERSATIONS ON EUROPE: “Displaced: The Refugee Crisis in the Mediterranean Basin"
The number of refugees entering the EU and Turkey has risen dramatically as a result of conflicts and crises in North Africa and the Middle East. The United Nations Refugee Agency (UNHRC) reported that European countries recorded 264,000 asylum applications during the first six months of 2014, an increase of 24 per cent from the same period the year before. The largest increase – 73 per cent – in asylum seekers was reported by countries in Southern Europe, in particular Italy and Turkey. Refugees originated primarily from Syria, Iraq, Afghanistan, Eritrea, and Serbia/Kosovo and North Africa. With conflict and destabilization in these regions continuing, European policy makers seek solutions that respond to both humanitarian concerns and an increasingly radicalized voting public. Join us for the next session of Conversations on Europe for a discussion of EU and Turkish responses to this growing crisis.